(Central Islip, N.Y., Feb. 8, 2018) – The Long Island Ducks today announced the signing of left-handed pitcher Andrew Barbosa. The starter will begin his second season with the Ducks and seventh in professional baseball. 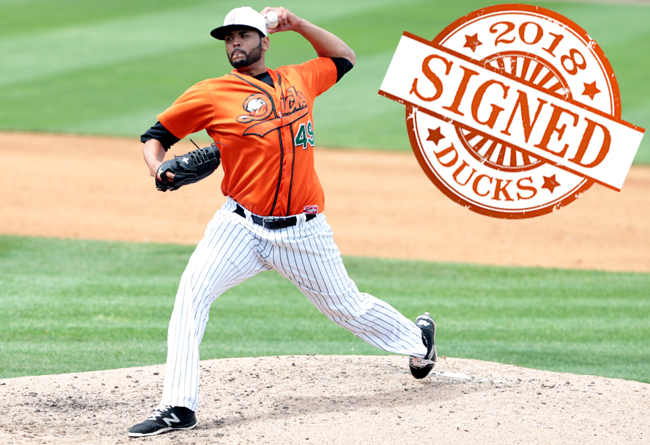 Barbosa joined the Ducks in May of 2015 and made nine starts. He compiled a 4-1 record with a 2.82 ERA and 59 strikeouts to just 19 walks in 51 innings of work. The southpaw allowed just two runs (one earned) over his first four starts with Long Island, spanning a total of 22 innings, and posted back-to-back games with 10 strikeouts on May 30 at Somerset and June 5 at Camden. For his efforts, his contract was purchased by the Atlanta Braves organization on July 9. The Puerto Rico native went on to go 5-2 with a 2.68 ERA and 51 strikeouts in 16 games (five starts) at Double-A Mississippi to end the year. The 30-year-old pitched at the Triple-A level for the first time in his career over the following two seasons. He split time at four different levels with the New York Mets organization in 2016, combining to go 3-0 with a sparkling 1.51 ERA and 71 strikeouts to 19 walks in 16 games (15 starts). He then made 36 appearances (four starts) with Colorado Springs (AAA, Brewers) in 2017, accruing a 7-3 record, one save and 65 strikeouts in 66 and one-third innings. Prior to his time with the Ducks, the University of South Florida alum spent parts of four seasons in the Arizona Diamondbacks organization. Barbosa was drafted by the Diamondbacks in the 36th round of the 2012 amateur draft.